14227.pdf - Pages: 182 - 14227 Religious Program Specialist 1 & C - Discusses the management skills necessary to the management of the Command Religious Program. Information is provided regarding the history of the Chaplain Corps and the Religious Program Specialist rating; office management skills and the management of naval communications; financial management; personnel management; and the education and training of Command Religious Program personnel, volunteer CRP personnel, and lay readers. 14228.pdf - Pages: 243 - 14228 Religious Program Specialist 3 - Covers basic information on the RP rating; command religious program (CRP); religious ministry facility (RMF); military weddings and funerals; major religions of the world; worship support functions; pastoral counseling support; information and referral assistance; logistics and support of the chapel, chaplain's office, RMF, and CRP; religious offering funds; religious education; publicity; security; library support; audiovisual presentations; and other aspects of chaplain backing and support, including religious program support in the field. 14229.pdf - Pages: 468 - 14229 Religious Program Specialist 3 & 2, Module I, Personnel Support - Covers basic information on the major religions of the world; worship support functions, chapel weddings and military funerals; information and referral assistance; publicity, material, and facility support within the Command Religious Program; audiovisual presentations; and shipboard library support. 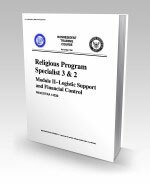 14230.pdf - Pages: 233 - 14230 Religious Program Specialist 3 & 2, Module II, Logistic Support and Financial Control - Covers procuring, providing, and inventorying the materials necessary for the support of the chapel program; the preparation of procurement and reimbursement documents and the maintenance of departmental budget records and operating targets (OPTARs). 14231.pdf - Pages: 206 - 14231 Religious Program Specialist 3 & 2, Module III, Administration - Covers the maintenance of Command Religious Program files and records; publications and directives; grammar and writing skills; presentation of correspondence; and officer and enlisted service records.